Everyone is familiar with New York City Statue of Liberty. She stands proudly on Liberty Island in New York Harbor. But did you know there are Statues of Liberty all around the world? 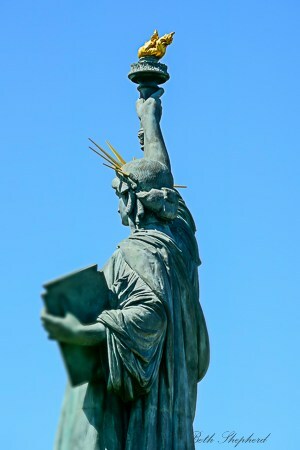 More than 15 countries have a replica of the ‘Liberty Enlightening the World‘ including France, Germany, Norway, Spain, Kosovo, Ukraine, Japan, Vietnam, China, Ecuador, Peru and Pakistan. In addition to New York City’s Statue of Liberty, I’ve seen four others, two in Paris and two in Seattle. New York City’s statue was designed by French sculptor Frédéric Auguste Bartholdi. 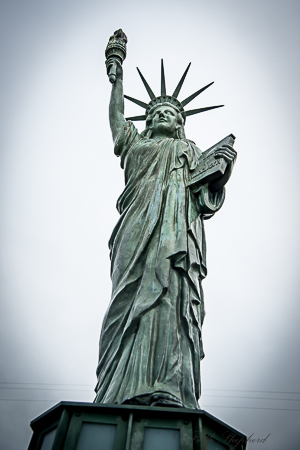 In 1876, French artisans and craftsmen began constructing the Statue in France under Bartholdi’s direction. The arm holding the torch was completed in 1876 and shown at the Centennial Exposition in Philadelphia. The head and shoulders were completed in 1878 and displayed at the Paris Universal Exposition. The entire Statue was completed and assembled in Paris between 1881 and 1884. Also in 1884, construction on the pedestal began in the United States. The Statue arrived in New York Harbor on June 17, 1885. Unfortunately, the pedestal for the Statue was not yet complete and the entire structure was not reassembled until 1886. On October 28, 1886, the statue of “Liberty Enlightening the World” was officially unveiled and over a million New Yorkers turned out to welcome her. The Statue is 305 feet, 1 inch from the ground to the tip of the flame. It is the equivalent height of a 22-story building and was the tallest structure in New York in 1886. 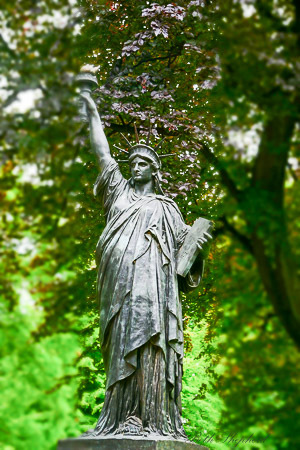 The most beautiful Statue of Liberty I’ve seen is in Jardin du Luxembourg, my favorite park in Paris. This is the original model for the Statue of Liberty, used by Bartholdi to create the larger version for New York City. 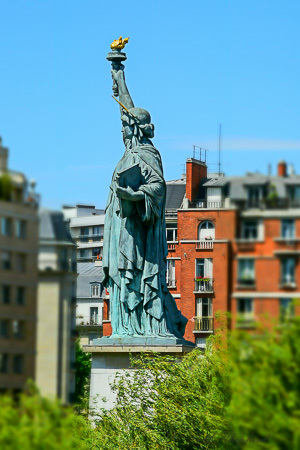 Bartholdi donated it to the Luxembourg museum for the World’s Fair of 1900 and it has been in this spot since 1906, standing approximately 15 feet tall on her base amidst the flowers and fountains of the beautiful gardens which are also home to the French Senate. 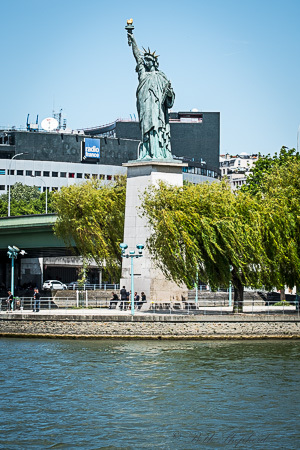 I saw a second Miss Liberty while strolling along the Seine. She was perched on the Île aux Cygnes (Isle of the Swans), a tiny man-made island with a tree-lined walkway, named l’Allée des Cygnes, which runs the length of the island. There is a also public work-out space underneath the Pont de Grenelle, close to the Statue of Liberty. This monument, 35 feet in height on her base, was inaugurated by French President Marie Francois Sadi Carnot on 4 July 1889, nearly three years after its counterpart, was given to the city of Paris by the Parisian community of America, commemorating the centennial of the French Revolution. The statue initially faced east, toward the Eiffel Tower, but it was turned west in 1937, towards its larger sister in New York for the Exposition Universelle hosted by Paris that year. Its tablet bears two dates. The first is IV JUILLET 1776 (July 4, 1776), the United States Declaration of Independece–like the statue in New York. The second is XIV JUILLET 1789 (July 14, 1789), the storming of the Bastille. Closer to home, there is a replica of the statue on Alki Beach in West Seattle. Seattle’s Miss Liberty is about six feet tall, and the original was dedicated in 1952 as part of a national Boy Scout ‘Strengthening the Arm of Liberty’ campaign to erect statues like this across the country. Unfortunately vandals damaged the statue in 2005 and in 2007 a newly cast statue was unveiled and put in its place. 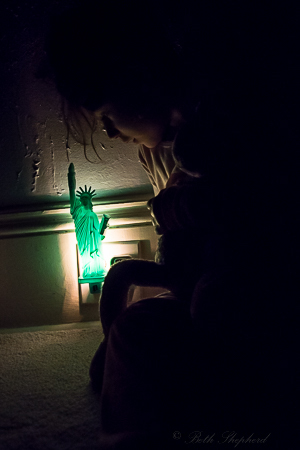 And, finally, the fourth Statue of Liberty is in my daughter’s bedroom. Big Papa brought her out to the west coast from The Big Apple. She might only be 8-1/2 inches tall, but she now lights the way for one four-year-old girl. 9-11. I was working in the Rainier Bank Building in Seattle, a tall tower in the middle of downtown. On the 22nd floor. That day, I was late to work and wondered why no one was at their desk when I arrived at the office. Had I forgotten an all-staff meeting? I found them, huddled together in front of the t.v. in the conference room, tears on their faces. And then I learned what happened. They evacuated our building, and all the tall office buildings downtown and sent us home. I felt so alone, in my apartment, glued to the t.v., which I normally never watch. 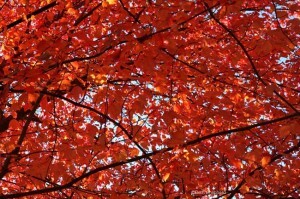 What I remember the most, is the complete absence of sound overhead. The skies were bright and blue, just like today, and an eery quiet filled the air. Not a sound. Not a single plane. I was lucky. I am lucky still. I didn’t personally know anyone who died. I didn’t live in New York City and I wasn’t faced with the horror of the what happened or the days and months that followed. But what happened changed many things that I do think about to this day. Especially when I travel. I think about 9-11 every time I toss my water bottle or my yogurt into the trash bin before I go through security. I think about it when I am told I can or cannot bring this or that with me onto the plane. I think about it when I pass through the scanner. I think about it when I board the plane and look at my fellow passengers, and wonder. The losses from that day are many. It’s impossible not to be moved by the stories of the men and women who were lost, and the lives their life touched: family and friends and coworkers. Most of the reminders I face are mere inconveniences compared with anyone who had a personal connection to those who died that day. But I do think about how, in an instant, the world changed. Today marks the third anniversary of my friend Dee’s passing, and tonight Joel and I will sit down to enjoy a bowl Moosewood Mushroom Barley Soup in her memory, just as we did last year and the year before that. Making this soup—which Dee and I enjoyed together on many occasions–is my way of honoring our friendship, a friendship which spanned four decades. For me, keeping up this tradition is a source of comfort. I miss Dee and think about her a lot. In the three years since she died, there have been many days when I’ve wished I could call and hear the sound of her voice, and when I wrestle with challenges that life sends my way, I sometimes wonder what words of wisdom she might have shared. Living life without loss isn’t possible–I know that. Granted, some encounter more than others, but loss is something we all must face: loss of those we care about, loss of dreams, even the loss of our own abilities as we age. So the more important question is how do we comfort ourselves? Prayer, meditation, time spent alone or in the company of family and friends, getting away from it all, solace from being in nature or getting lost in the hum of urban life, working out, doing yoga, gardening, walking the dog. Each of us has our own unique way of seeking comfort. And then there’s comfort food. Whenever I hear those two words rich, hearty fare springs to mind: Mac ‘n cheese, meatloaf, mashed potatoes or apple pie and a bowl of ice cream, or a bowl of steamy soup. Everything about Moosewood’s Mushroom Barley Soup reminds me of Dee, from the earthy smell of mushrooms which conjures up memories of playing in the woods behind our houses, just across the street from each other– to sharing a meal at Moosewood Restaurant whenever we could scrape up enough change, as Cornell undergraduate students, living in a house together in Ithaca, New York. But mostly my heart remembers the many times Dee and I made this soup for each other: she for me, me for her, and occasionally side by side. So today I toast to you, my friend—the friendship we had, and everything you brought to the table. Searching for more comfort? Check out Wanderfood Wednesday. Big Papa and I spent the past week in upstate New York. We were there visiting my mother and my sister, who is ill with cancer. I knew that it would be a tough, emotional five days. 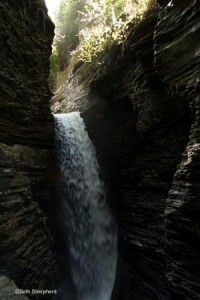 So, at the end of our stay, we sought respite for two days in Ithaca. It’s hard not to feel at peace with the world, when one is surrounded by dramatic gorges, waterfalls, gentle rolling hills, lush green fields and an abundance of wildlife. 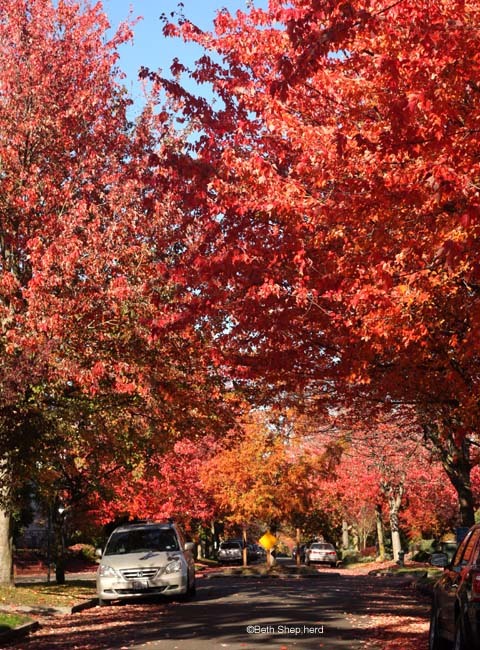 During the years when I was an undergraduate student at Cornell University, I used to marvel at how so much beauty could be packed into a thirty mile radius. Three decades later, I still do. 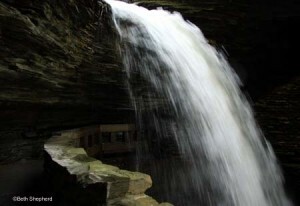 Back in my college days, if the weather was warm and classes were over for the day, I’d grab my bathing suit and head to the base of Cascadilla Gorge. I still remember how idyllic it felt to descend the stone stairs cut into the side of the gorge and enter into a mythical world which existed mere minutes from where I lived. If I was lucky enough to find a friend with a car, my options for sybaritic pleasure increased exponentially: Ithaca Falls, Buttermilk Falls State Park, Robert H. Treman State Park, and Taughannock Falls State Park were an easy fifteen-minute drive at most. 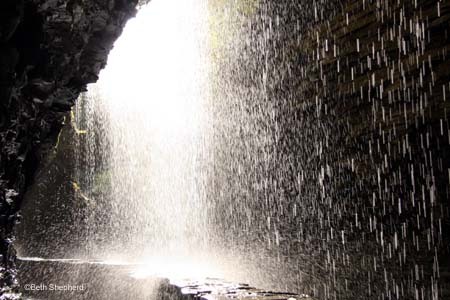 Even the mind-blowing Watkins Glen State Park, lies waiting only thirty miles away. The famous gorges and waterfalls of the Finger Lakes region, where Ithaca is located, exist as a result of the interaction between the south-to-north running river valleys, which were gouged by glaciers numerous times over the last two-million years, and streams running obliquely to the glaciers, which filled with glacial sediment. 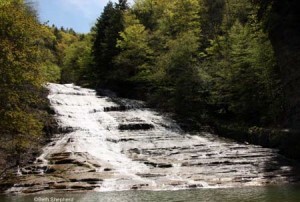 The story of the gorges began when the Finger Lakes were river valleys with small streams flowing in from the east and west. 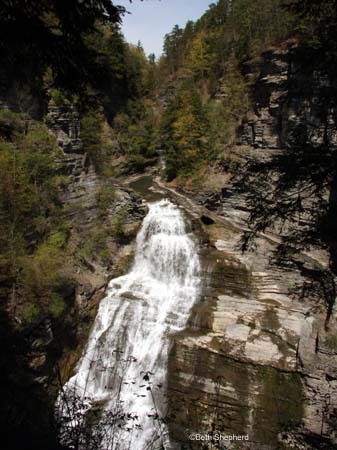 The valleys were repeatedly filled with hundreds of feet of glacial ice that originated from glaciers advancing south out of Canada, eroding the valleys deeper. As the ice melted and glacial sediment dammed the river valleys, deep lakes formed and streams plunged as waterfalls from the glacially steepened hills. Then over time, as the lake levels dropped, a series of steps were left on the hillsides, like at the overlook at Taughannock Falls. Big Papa and I crammed in as many scenic spots as we could manage during our trip. The places we went to were a feast for our eyes. 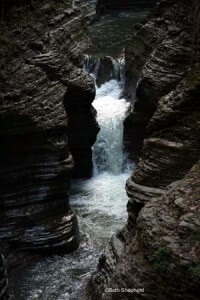 And our time spent in the gorges of Ithaca was, as it always is– gorgeous —in every way imaginable. Rain pounds on the windshield of our rental car as we drive up the gravel road in Ingomar, Pennsylvania, just north by twenty minutes from Pittsburgh. The temperature outside is unseasonably cold and we hear that several inches of snow had fallen the week before our visit. Today the skies are gray, and trees still cling to their colors, with hues of brown, rust, yellow and burgundy coated the rolling hillsides. Big Papa and I are on our “Tour of the moms” trip. We plan to spend six days visiting our childhood homesteads and haunts, three days in Pittsburgh where he grew up followed by three days in Syracuse where I grew up. Both our mothers still live in the cities of our birth. 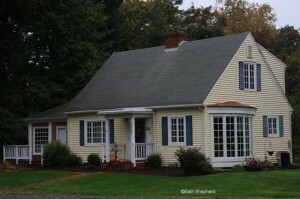 Turning left onto Wilvan Lane, we quickly spot the Cape Cod-styled house, now painted a soft yellow. Wilvan Lane is tiny with just a handful of homes sharing the intimate road named after two of the families who lived on it, the Wilsons and the Vandervorts. Big Papa moved to this house when he was four years old and his parents lived there until his father passed away and his mother moved into a retirement community. Since that time, it’s had two owners. Next door sits a grand old stone house where Tom, Joel’s closest friend and the best man at our wedding, grew up. For Big Papa, a couple decades of adventures and mischief went down in the lanes and yards surrounding those homes. “Come on in. I’ll show you around.” Walking up to the back entrance, our tour guide introduces herself. Melissa has owned Big Papa’s former digs for several years now. She enthusiastically guides us through the house pointing to lovely original oak wood floors, heretofore unknown to Big Papa who lived with wall-to-wall carpet during his years in the house. Our last stop on the tour is the basement. Big Papa’s father lay claim to this space and piled it high and deep with tools, wood, a darkroom and project upon project. As we chat, I hear Big Papa catch his breath. “My father’s workbench. I can’t believe that it’s still here.” We run our fingers along the weathered wood with its shiny patina from years of use. “I never could see much of the bench with all the stuff piled on top of it,” Big Papa tells us. I wanted to reach out and hold Big Papa close. I know he is thinking about his dad, long passed. I’m sure he can almost hear small feet running down the stairs to see what mysteries might be uncovered in the busy basement workshop. He probably smells faint traces of developer wafting from the side of the basement where the darkroom once stood, and remembers how pungent aromas from fresh cut wood lingered in the nooks and crannies. Big Papa told me that once, as a child, he secretly “cleaned” the basement work area as a birthday present for his dad. Tidying up the messy space seemed like a good idea at the time, until his father arrived home. A look of displeasure crossed his face. He didn’t yell at Big Papa but sternly told him to ask the next time he considered tackling a similar venture. Leaving Pittsburgh for Syracuse three days later, we fly over a beautiful patchwork of fall color. Farms dot the landscape and small towns sit side by side with verdant woodland. I think to myself how lucky we both were to grow up in such a spectacular setting. I also muse about how different it is to go home versus to be home. 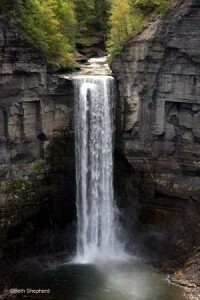 We arrive in Fayetteville, New York, a small village twenty minutes southeast from Syracuse. Another yellow house, my childhood home, comes into view as we walk up Highbridge Street from the Craftsman Inn where we’re staying. Fifty years later, my mother still resides in the house I called home for the first eighteen years of my life. 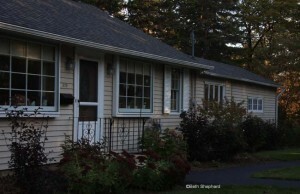 It’s a small ranch-style home, built in the 1950s when new suburbs sprung up across the U.S.
Across the street is the large gray house where my close friend Dee lived, along with her ten siblings. I can feel my heart wince a bit as we pass by. 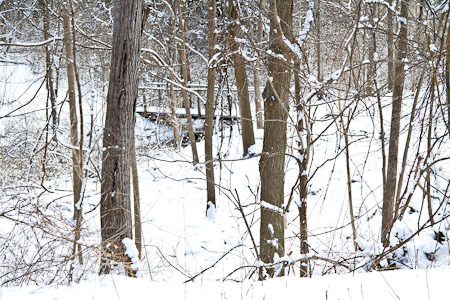 Ten years ago, Dee’s parents moved to a townhome a few miles away and Dee died last Christmas. Time changes all things. 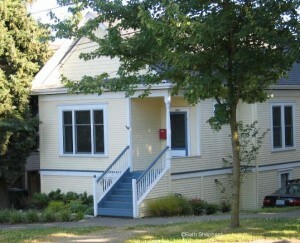 That I grew up in a yellow house, Big Papa’s boyhood home is now yellow and our home in Seattle, the Urban Cabin, is also yellow is a fascinating coincidence not lost on me. Four decades passed before Big Papa and I crossed paths. While we found each other on the west coast, our shared roots are in the east. Both our fathers had a woodshop and a darkroom in the basement and both were paralyzed by strokes. Big Papa has a sister, as do I, both of whom suffered from illness as children. My sister had cancer twice and, as a young teen, Big Papa’s sister began her lifelong struggle with mental health issues. We have many, many differences between us but there are an equal number of ways in which we are kindred spirits, our experiences cut from similar cloth. My mother greets us at the door and before we are ushered into the house, we take a walk through the yard. 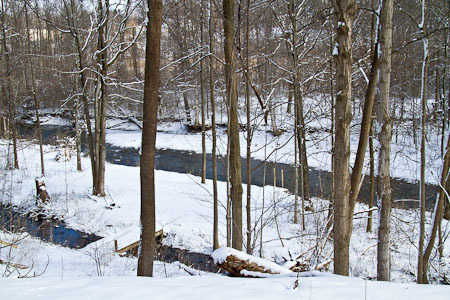 Although I grew up on a very busy street, our property backed up to a sizable protected wooded area with two streams. My father was an avid gardener and part of our lot was filled with every edible plant imaginable. A compost pile still collects leaves in the farthest corner of the back yard, and I remember how my steps would quicken as I carried the remains of our meal out to toss in the compost. What danger I imagined lurked there, I do not recall. I am often surprised I felt scared to be alone surrounded by the trees in our back lot since it was also a place of great discovery. My father found milk glass dishes left by early settlers and ancient arrowheads, once used by Iroquois Indians who first walked the land. 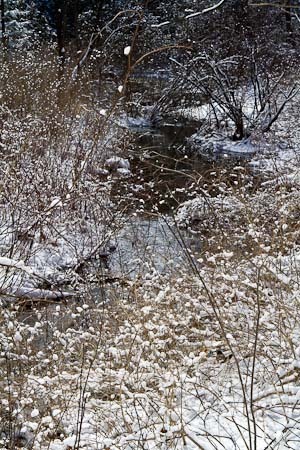 As we walk and talk with my mother, we hear the sound of Limestone Creek gurgling in the background. 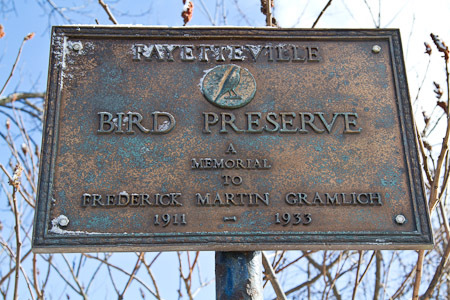 Birds fly freely in the sanctuary established before my parents bought the house. 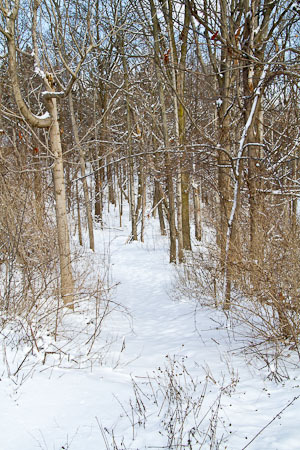 No one will ever be able to build in these protected woodlands. I know my love of nature and plants comes from this magical place. Back inside, my mother tasks us with going through belongings saved over my lifetime. Over the next three days, we uncover photos, trinkets, artwork and letters that fill boxes stored in our attic and closets of the house. A flood of memories, some happy and others painful are brought to life as we pick through dusty relics lovingly stored by my mother. The members of my family are all ‘savers,’ with me being the least inclined of the foursome. Later, as we walk back to our room at the inn, Big Papa and I talk about the psychic weight entrenched in generations of memorabilia. What to keep and use, what to keep but store, and what to toss? We are the caretakers for our own treasures, those of parents and all the generations before. My father’s artwork alone would cover every inch of wall space in our house if I put them all up. What of my own creations? How do we show respect for what has passed and honor the present without drowning in stuff? Should we successfully adopt, will my child cherish the twelve years of classroom photos, taken from Kindergarten on? Or will he relinquish them to the trash bin? Surely if his style leans mid-century modern, he won’t see the charm in our oak kitchen table or the dresser hand-painted by Big Papa’s father. Will he feel burdened, as I did, to haul something comparable to my father’s unwieldy darkroom enlarger for decades from apartment to apartment until I finally, with a mountain of guilt, dispatched it to the dumpster behind my building before shacking up with Big Papa? 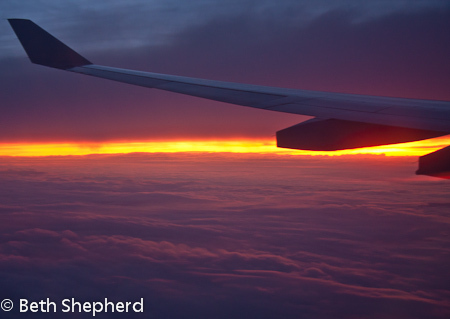 We leave before dawn on the morning of the seventh day of our journey across the country. I feel heavy, loaded down with the gravity of memories from conflicted relationships, roads taken and not taken. While we can always return to the places of our youth, we are no longer young when we do so. A sense of place grounds us to the land we hail from and to the places we’ve laid our head. Familiar colors, scents and sounds are imbedded deeply in our souls, whether gentle rolling wheat fields, wide open plains or lush forests. Traveling back to a place, the memories we conjure are at times pure poetry and in other moments wounds rubbed raw. No matter how far we roam, the stories from our childhood and the places we’ve called home become a part of our internal landscape. I still recall the promise of an east coast spring when the first crocus pokes its brave head through the frost-covered ground in our yard. Walking past lilacs in bloom, I smell the sweet fragrance and can almost feel myself cradling the overflowing bunches against my chest, just as I’d done with the branches cut from the bush outside my childhood porch. 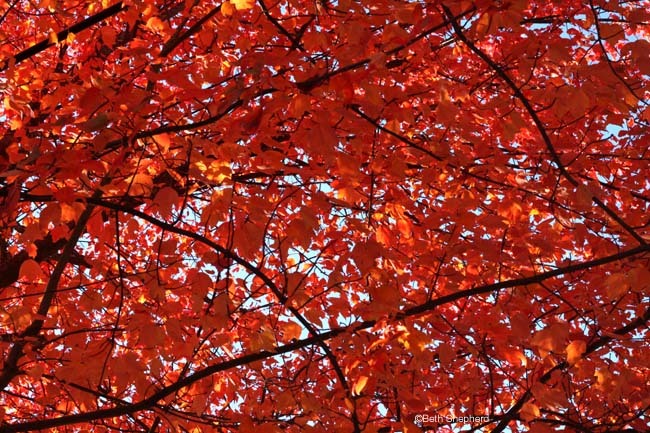 Each fall, I thrill at the sight of rich red maple trees and remember the hillsides of central New York, covered with their vibrancy. Even though decades have passed, and the scenery outside my window has changed, I will always carry with me, a piece of the places I’ve called home. No one will ever be able to completely take away the east coast from the girl. Upon our return to Seattle, the taxi drops us off in front of the Urban Cabin, looking as chipper as it did when we left it. Our steps are sure and swift, and we bound up the front stairs until we reach the front door. Simultaneously, we both let out a great sigh of relief. Back walls torn off for our remodel and lives crammed temporarily into 450 square feet notwithstanding, our little yellow house never looked more beautiful. Tonight we will lie down side by side in our bed. Maggie, the cat, will curl up next to us and purr contentedly. I know, almost instinctively, which fir board will creak when I rise in the morning and place my feet on the floor. These four walls are rooted steadfast in our bones. We are home, our home. Some of my earliest memories revolve around my friend Dee. I was six years old, living in a small town in upstate New York, when her family moved in across the street. My sister and I watched as they carried bed after bed across the lawn into their house. We were a family of four and they were family of 13, so we stared in amazement. As young children, we were good friends. I remember building snow forts in the winter and riding bikes around the neighborhood in the summer. We played dress-up and went to each other’s birthday parties. Dee and I were close for 44 years. We drifted apart for a time during high school, though we did have overlapping circles of friends. My senior year at Cornell University, after I returned from a semester studying in Amsterdam, we rented a house together. Our friendship as adults stood solidly from that point on. My favorite memories are of meals we cooked together with ingredients from our local farmer’s market. 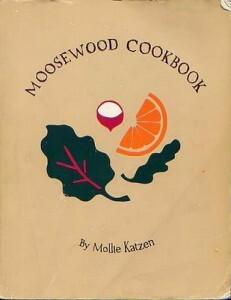 Recipes from the Moosewood Cookbook, like Mushroom and Barley Soup. To this day, enjoying good food and making a meal to share, is a way I connect best with those I care about and an expression of love. Dee and I would sit at the table at our rented house on College Avenue and talk for hours. I learned so much from her and, over the years, could always count on her sage and to-the-point wisdom. After college, I moved first to California and then Washington State. 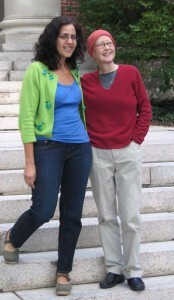 Dee moved to Vermont, then Maine, followed by Minnesota when she got married, and finally to Massachusetts. We kept in touch through letters and occasional phone calls. It was comforting to have a friend who understood me and knew my family history. Hearing her voice always centered and soothed me. She reminded me of what was truly important in life. Dedication to those you care about, deep friendships, and being true to oneself. This weekend, Dee’s friend Kate was in town for work and we had an opportunity to catch up. Dee and Kate met in college. 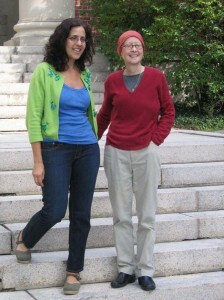 In fact, it was during my stint overseas that Dee transferred to Cornell and sublet my apartment. I spent time with Kate too, but she was Dee’s friend. Over the past thirty years, Dee helped us keep tabs on each other. She was the glue between her friends. She remembered the details in our lives and stayed connected with us, no matter the miles or years that came between us. I really enjoyed the time spent with Kate, kindred spirits and a shared friendship with Dee. We might not have reconnected in this way, if not for the December memorial in York, Maine. Dee died a few days before Christmas after a decade-long struggle with breast cancer. Kate and I were both at the service, the first time in 27 years we’d seen each other in person. I feel so blessed to have known Dee. Her friendship was one of the greatest gifts of my life. I am, without a doubt, a better person for having known her. I feel a profound sense of loss that she is no longer in the world. So it was a great honor, though bittersweet, to have Kate here in Washington. She was able to meet Big Papa and visit the Urban Cabin. We gathered the makings for dinner at our neighborhood farmer’s market and enjoyed a good meal and even better conversation, on our deck. We laughed. We cried. We reminisced. Together, we shared the simplest pleasures in life, which was the essence of our friendship with Dee, and the memories we will always keep close to our hearts.